I almost forgot to post about this. Been busy the last few weeks prepping for a cruise with the family that turned out to be a well needed vacation. 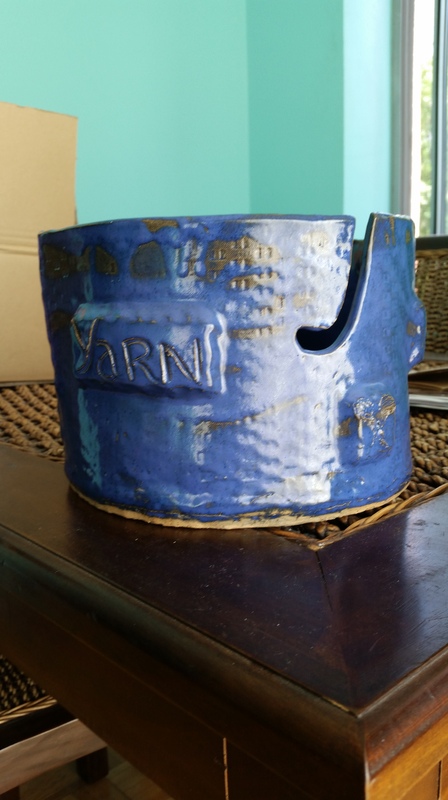 In between, I got the email from La Mano pottery stating that the yarn bowl I made was finally ready for pick up. That episode almost turned out to be drama in itself. I receive the email over the weekend, and made plans to head there the following tuesday. 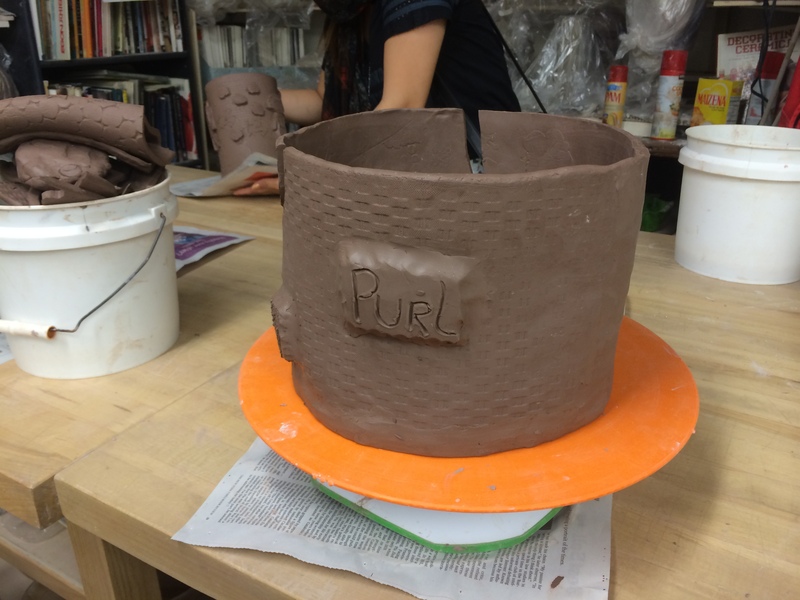 When I get to the studio, I tell the receptionist at the counter I’m here to pick up my pottery. I give her my name, and date of the class and she proceeds to search. She’s looking through all the bags of student projects stored on the shelves and she cannot find it. Another worker joins the search, they go to the back, downstairs in their basement. Still no pottery. My heart is slowly sinking. All kinds of wild thoughts are going through my head. What if it broke? Did they mistakenly give it to someone else? Twenty minutes I’m standing there and staff can’t find it. Finally she apologizes and tells me to follow up “Damien”, the staff member who emailed me to pick up my bowl in the first place. I follow up later with a “dude, where’s my stuff?” email to Damien, he replies it’s been found. I return to the studio two days later. I encounter another receptionist and some different staff, which included the instructor I had for the course. In the midst of another 10-15 minutes of not knowing where it is again, the owner, a middle aged woman with a pleasant manner appears. She remembers my yarn bowl, remarking on it’s size. 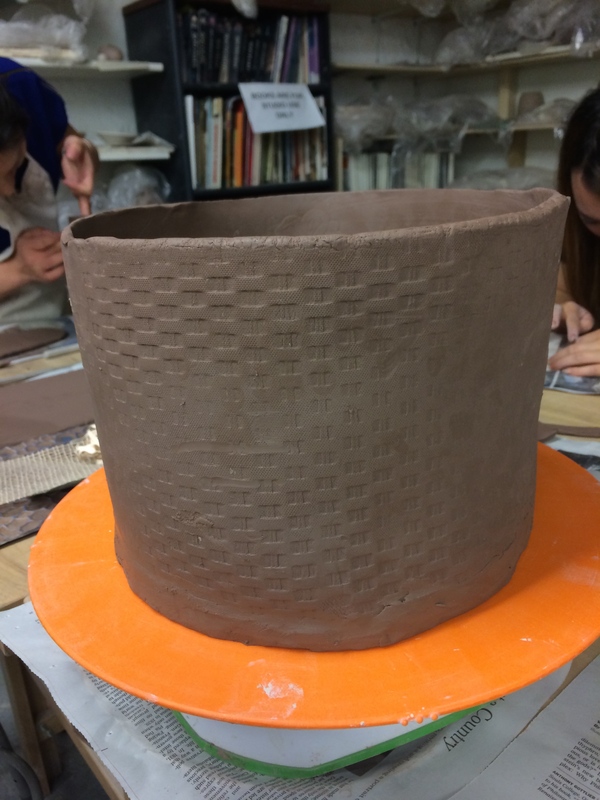 “It’s so big, students don’t usually make anything that large in the wheel throwing classes.” What can I say? 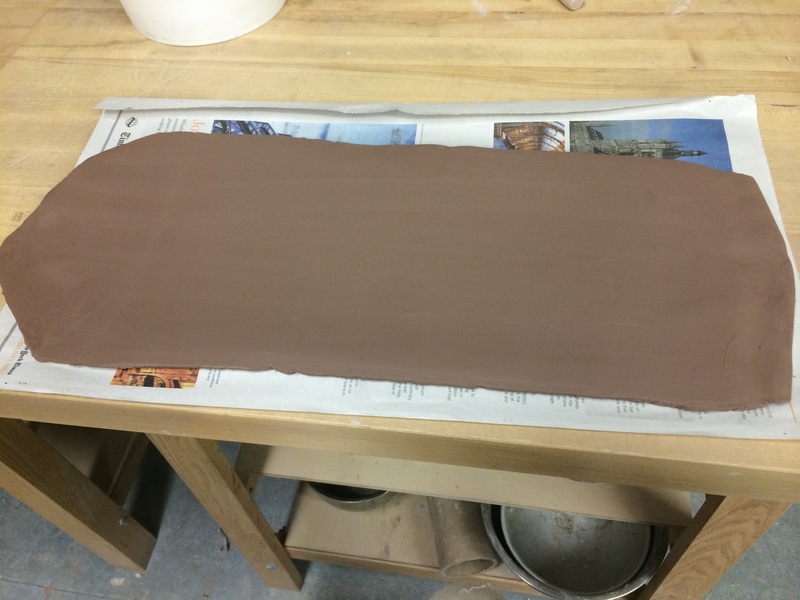 The class was at half capacity being it was Easter Sunday, so there was extra clay to work with. 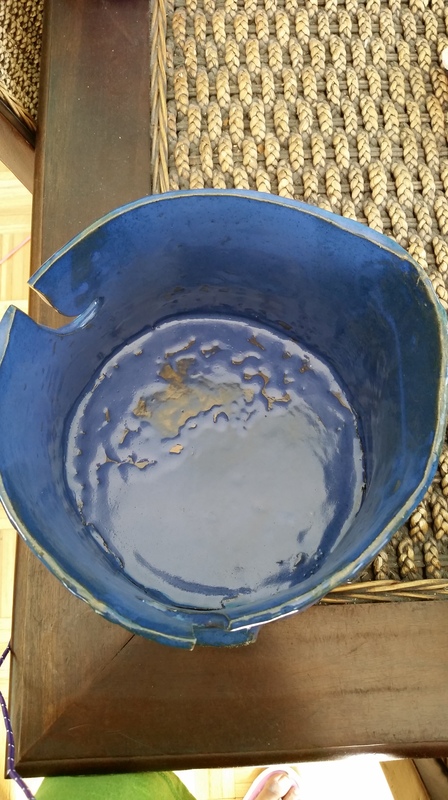 She also recalled having worked on the finishing of the piece itself, noting she had to do repairs on the cylinder portion which had separated from the bottom. After all that drama, they finally present my piece. I’m pleased with the way it came out for my first project. 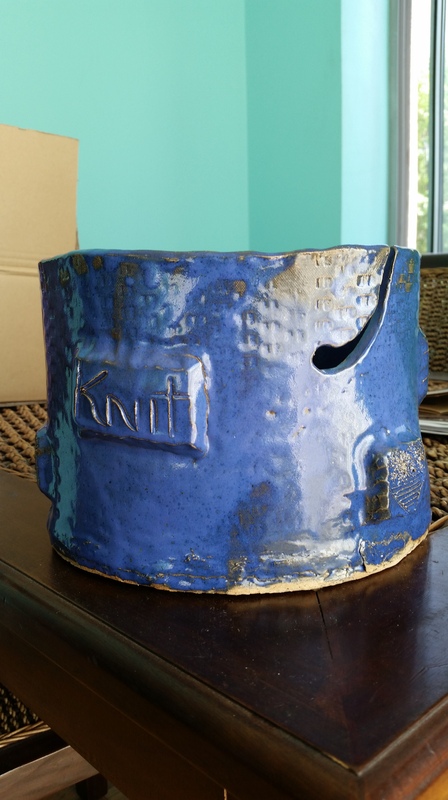 It’s got some sharp edges on the inside so it won’t work for practical use as a yarn bowl, but it’ll make for a nice display piece in my crafting room. They glazed it a cobalt blue. I’d have preferred a mix of colors or some accent colors, but students were not permitted choice in coloring. And now, the pictures. So tell me, did I do a nice job or what? I admire those yarn bowls, but most bowls made will only fit average size skeins of yarn & I haven’t been able to find a yarn bowl large enough to fit a skein with a lot of yardage. Then one day I’m browsing groupon and spot a deal for pottery class and suddenly I had dreams of creating my own yarn bowl from scratch. 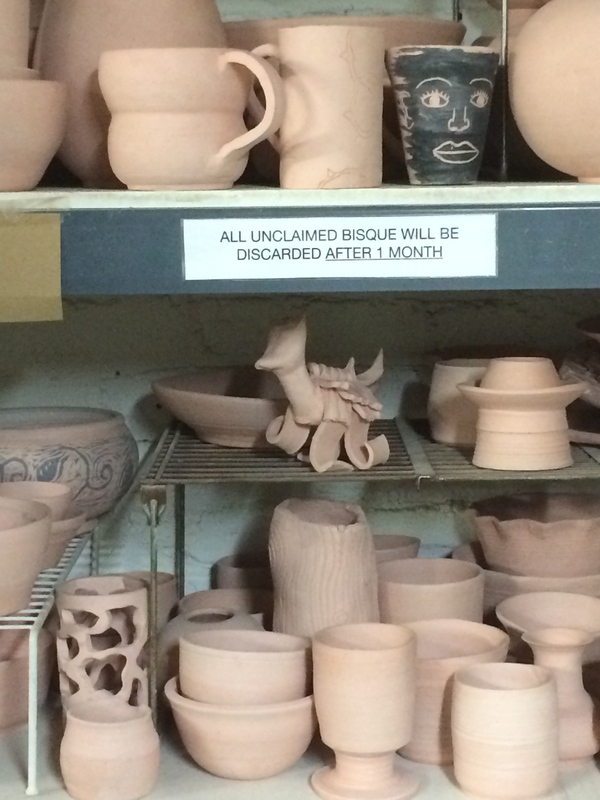 So thanks to one of those groupon deals, I signed up for my first pottery class. It was only an introductory course but the thought of coming home with an original piece I made of my own I couldn’t resist. 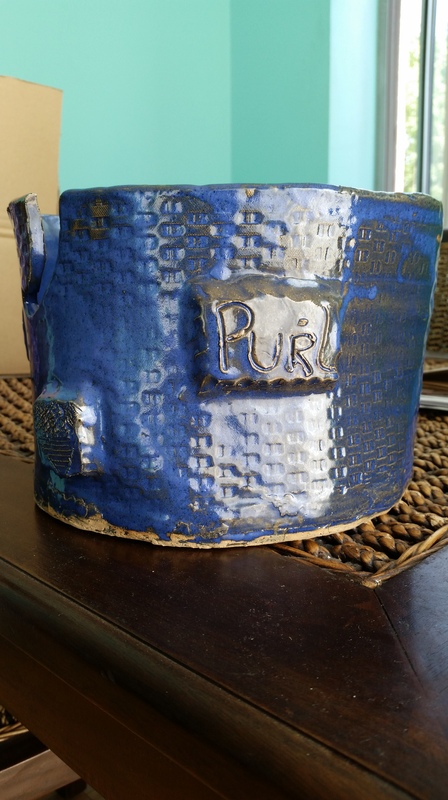 Not knowing there were several types of pottery classes available, at first, I signed up for a hand thrown pottery class, then had trouble with scheduling because all the classes had been booked. 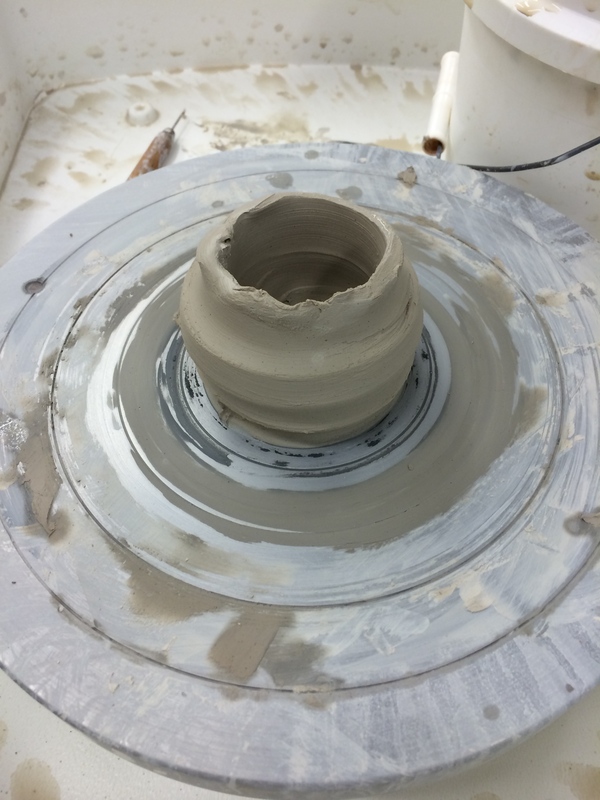 While waiting for more classes to be scheduled, I then found another deal also on groupon for a wheel thrown pottery class at the same studio. I thought it was a good chance to compare the two methods & see which one I would prefer. 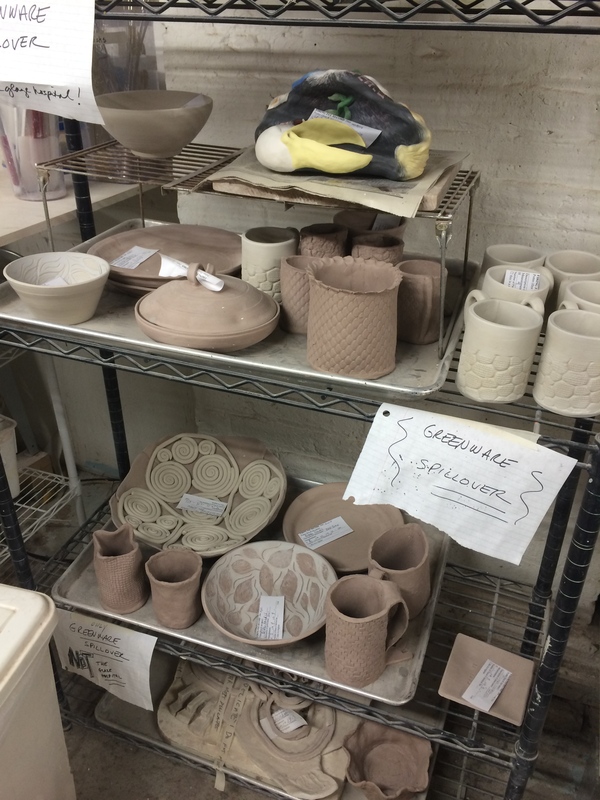 So on a warm late saturday afternoon I head downtown to La Mano Pottery in the Chelsea section of Manhattan, just around the corner from the world famous Fashion Institute of Technology. I arrived about 10 minutes early for the scheduled 6 PM class, and the guy at the reception counter instructed me to return at 6:00. After a bit of window shopping, I come back and get set up for class. 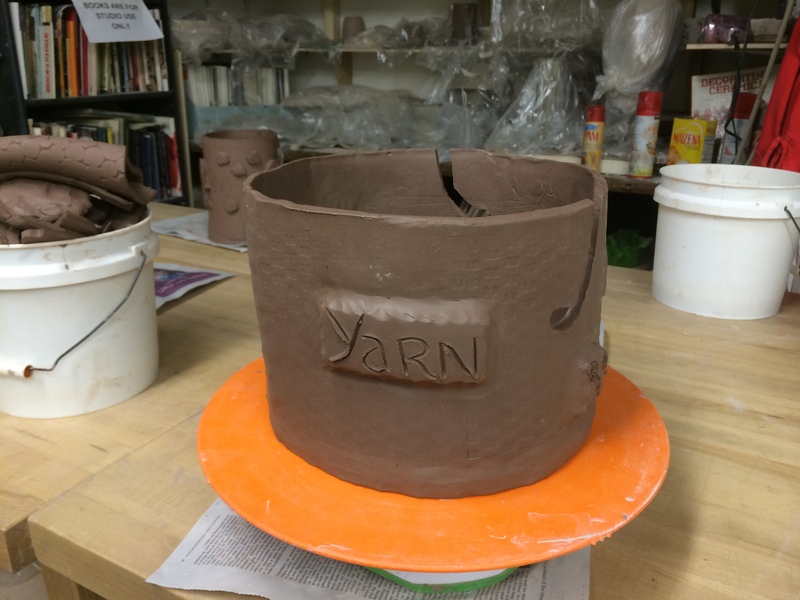 The environment is an open studio, with separate areas for individual students and artists to work on their crafts, as well as separate teaching areas for wheel throwing and hand throwing pottery. 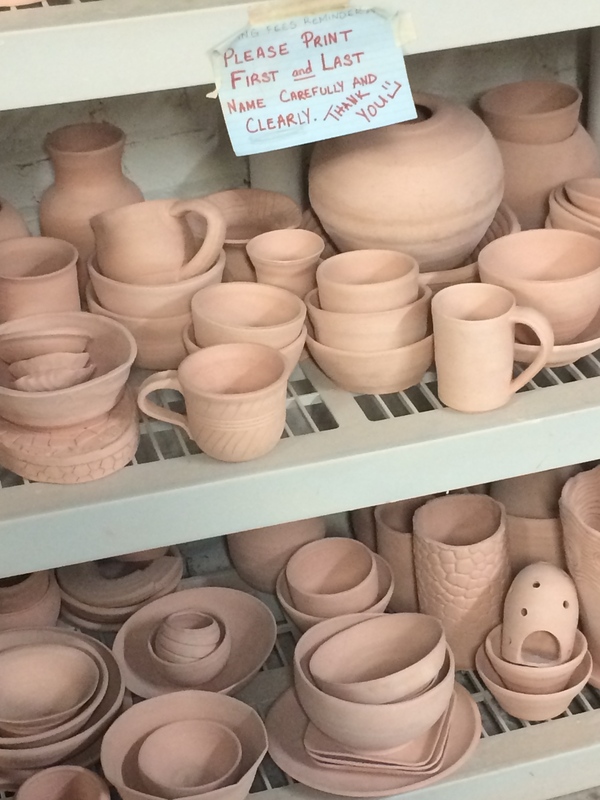 The studio offers introductory as well as multiple week courses for adults & children. 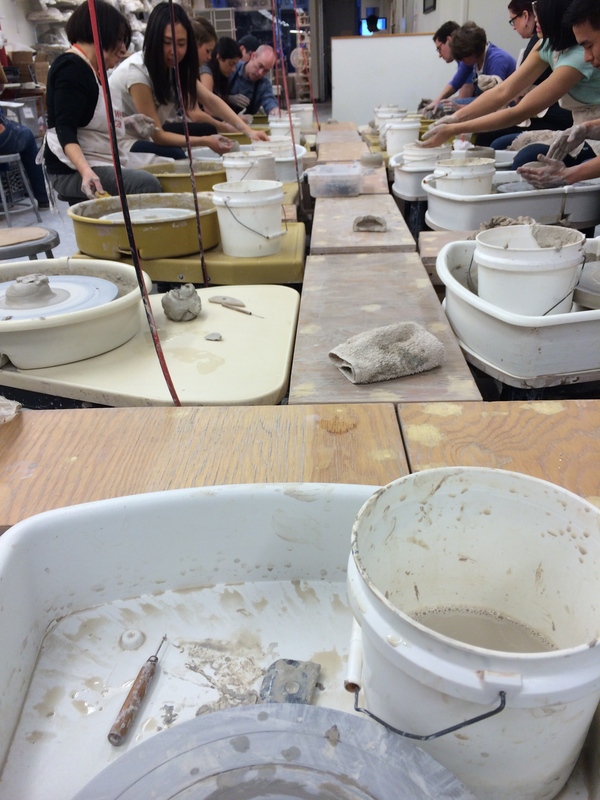 Classes are small with about 12-15 students, each sitting in front of individual potter’s wheels. I think clay artisans in the ancient days must have been mostly short in height because you’re sitting on a small folding stool that is relatively low to the ground. Someone who is tall may experience a little back pain after a while from the constant having to bend over the wheel. But this is how you start. 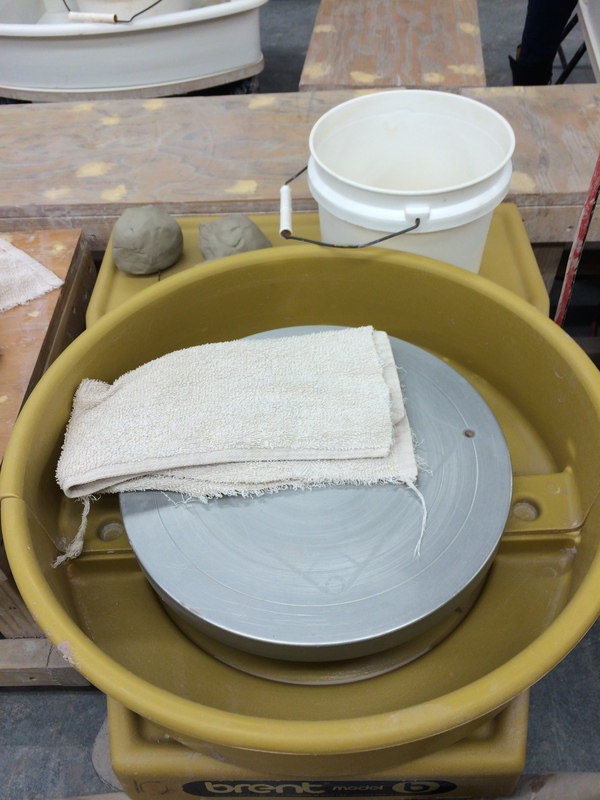 Each student is given a few balls of clay,a couple of tools to help shape the object you’re constructing, a bucket of water & a sponge. The instructor went through beginner techniques. 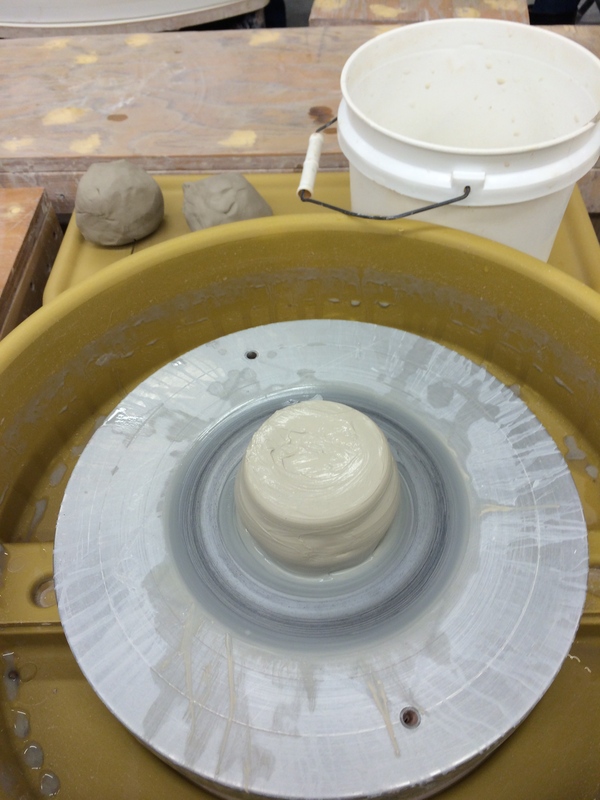 How to shape the clay, center it on the wheel, spinning the wheel and manipulating the clay while on the wheel. There were a few mishaps during class. I and another student had to move to new wheels because the instructor found they were spinning in the wrong direction. 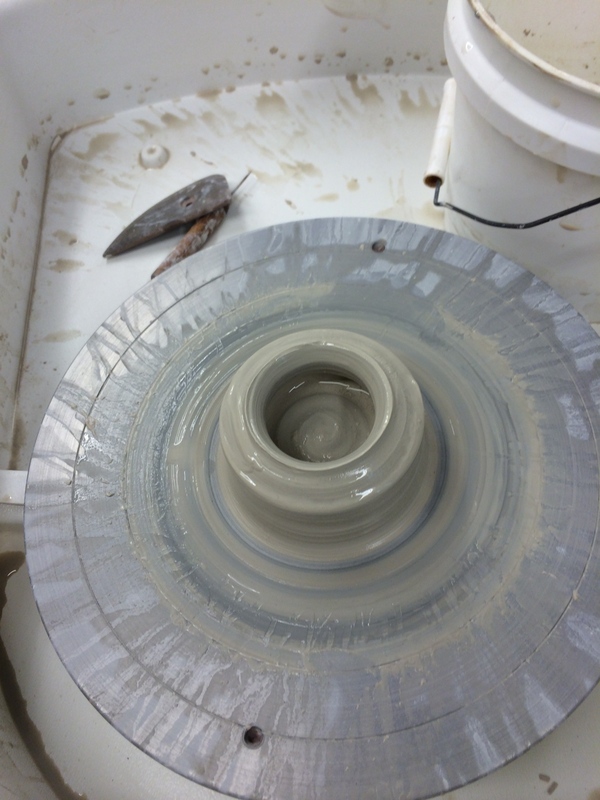 The clay wouldn’t stay centered on the wheel. I couldn’t figure out the optimal speed for the wheel; either it was spinning too fast or too slow. 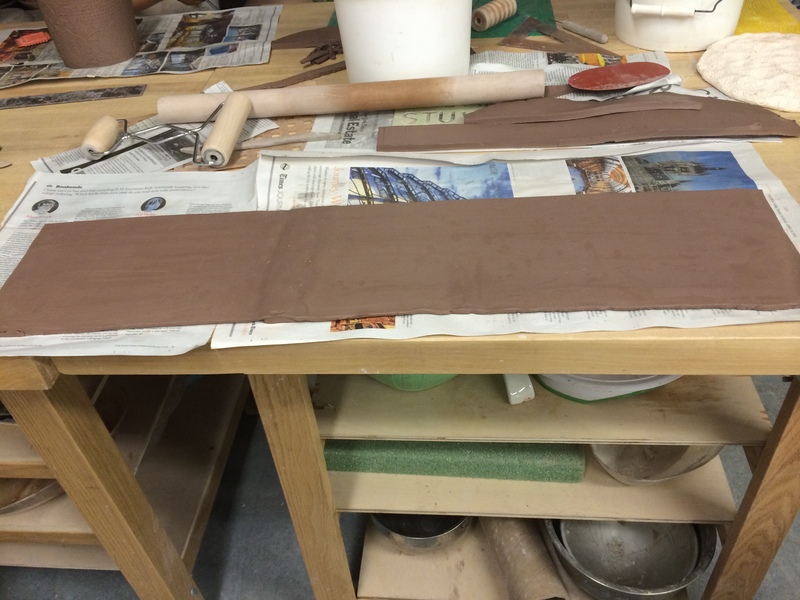 One woman expressed she found it therapeutic just playing in the clay. Another student looked as if she had taken classes before, although claiming to the instructor it was her first time. She created one sculpture after another, while I struggled just to get basic techniques down. And after a good deal of time had passed, I finally was able to create my first “masterpiece”. A miniature bowl. 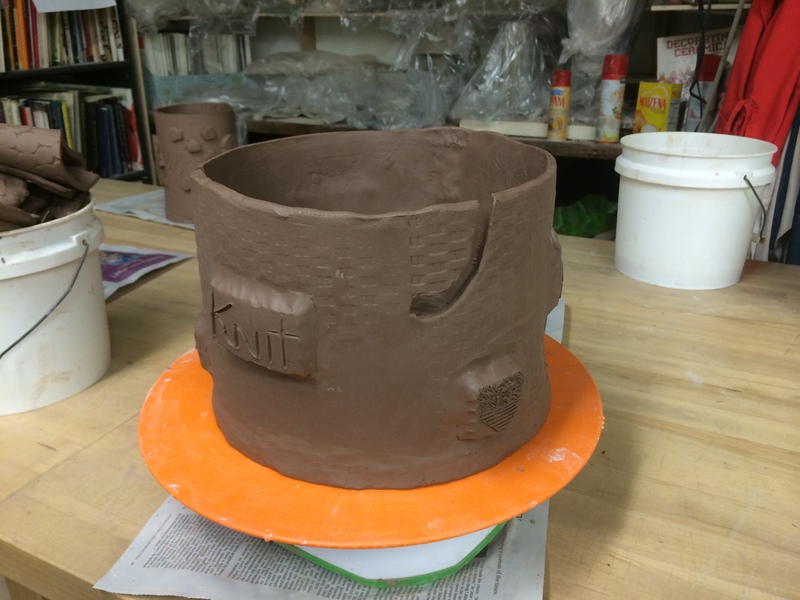 Too bad none of the pieces created during wheel throwing class could be saved. This would’ve made a fine ashtray, or maybe a shallow candy dish. After 2 hours, it was time to clean up the mess. A fun time was had by all. 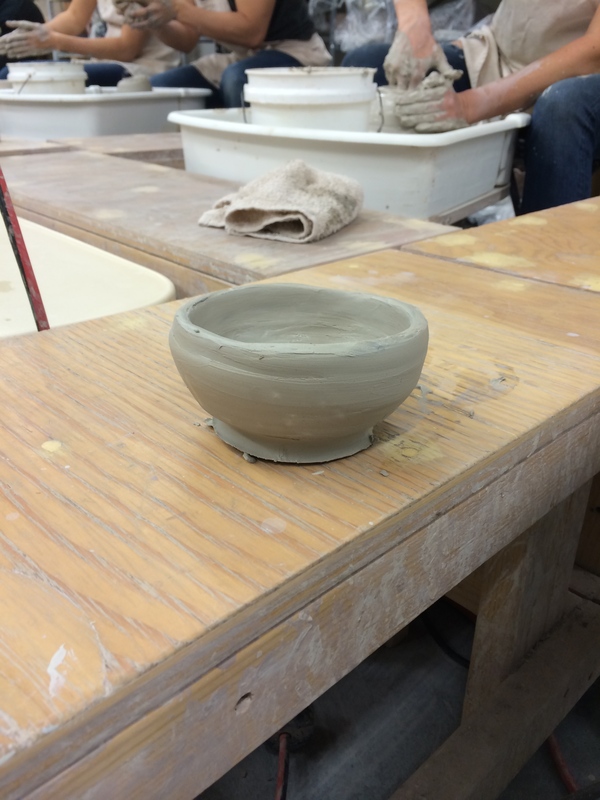 But unless I get a lot more practice, I think my dream of making my own yarn bowl might be deferred at this point. 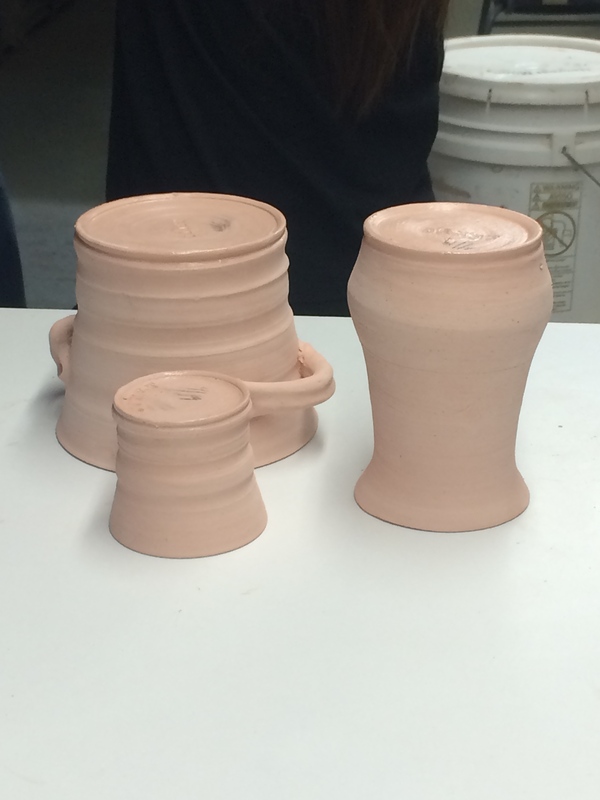 I have a second class in hand thrown pottery at the same studio the following week. Maybe I’ll have an easier time there. Meanwhile I’ll leave you a video for one of the experts to show you how it’s supposed to be done.